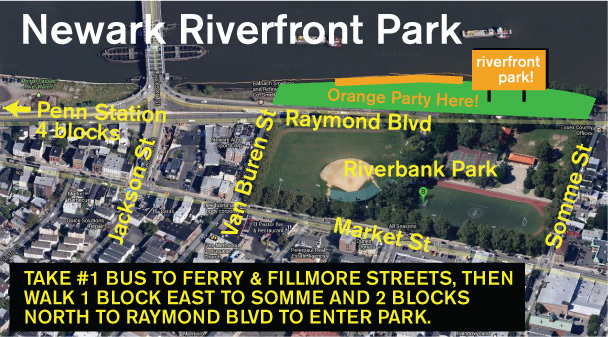 Saturday, August 3 Newark River Celebration: Walk to the Water & Orange Party! On Saturday, August 3, you are invited to celebrate and participate as Newark returns to its river! 9 am at Newark City Hall, join people from across the city and the region to walk from downtown to Newark’s newest segment of riverfront park. Carry a sign to represent your neighborhood or group (we’ll have supplies to make them), wear your orange (in honor of our new orange boardwalk) and stroll with musicians, dancers, and more. Contact Riverfront Coordinator Chris Caceres to reserve your place at newarkriverfront [at] gmail [dot] com or (201) 563-2834. Then, starting at 11:30 and running through evening, keep your orange on for the Orange Party to open the park and its orangeness with Mayor Cory Booker, County Executive Joseph D. DiVincenzo, Jr., stepdancers, spoken word artists, a jazz band, Brazilian capoeiristas, face painters, Double Dutch jumpers, and more. Plus, at 12:30, we will dedicate Song of the Passaic, the Newark Public Art Program‘s largest project to date. Join people from across the city and the region to stroll 1.5 miles from Newark City Hall to Newark’s newest riverfront park with musicians, dancers, and more! Carry a sign to represent your neighborhood or group (we’ll have supplies to make them) and wear orange in honor of Newark’s new orange boardwalk. First 150 walkers receive a souvenir shirt! 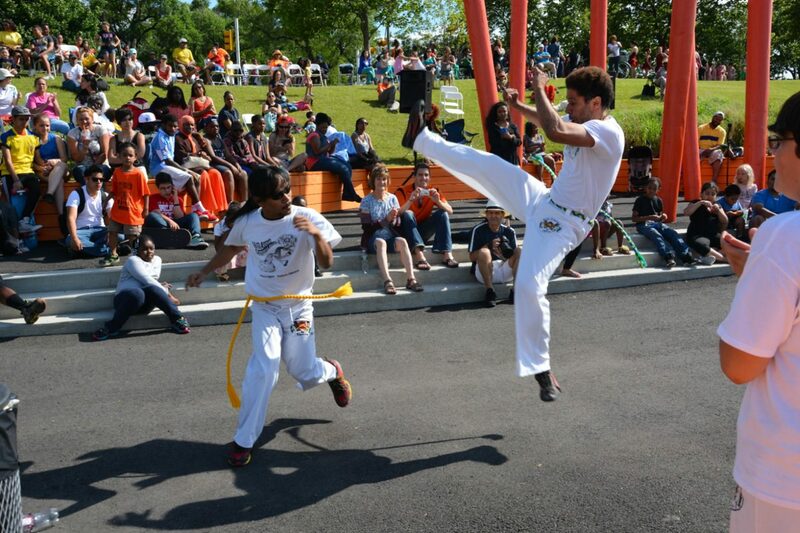 Fun & free activities for all ages including boat rides, interactive demonstrations of Capoeira, Double Dutch, Zumba and yoga, arts & crafts, facepainting, kite flying, Sewer-in-a-Suitcase and other environmental education games, a drum circle, and more! Featuring Newark talent & culture including electric jazz/R&B band the Melectrix, dance group Dynamic Dynasty, traditional music and dance from Brazil, Ecuador, and Portugal, Brazilian martial artists Grupo Libertade, and Newark Youth Idol winners. Please note: 11:30 am ribbon-cutting is rain or shine. Watch this space for any updates on other events. See scenes from last June’s Walk to the Water, led by the Malcolm X. Shabazz Marching Band and River Celebration. This entry was posted in Building Things, Public Programs on July 14, 2013 by NRR.